Context, UPC KUleuven iswm EFT Belgie. 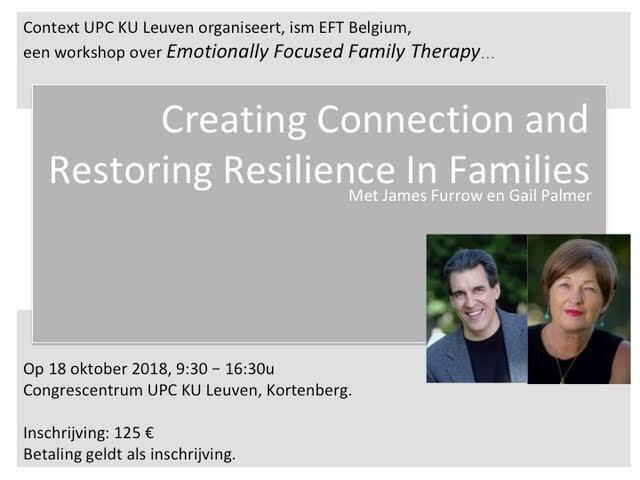 Context, UPC KUleuven in association with EFT Belgium. both systemic and experiential interventions to mend broken bonds and heal fractured families. that block family members from accessing the resources they would otherwise share. strained through emotional distance and distress. accessibility, responsiveness and emotional engagement. Identify the EFFT process of change and markers to guide the therapist’s focus. Learn strategies for working through parental blocks to caregiving. Explore the power of vulnerability in restoring emotional balance in family relationships. Gail Palmer, RMFT, MSW is one of the Founding Members of the Ottawa Couple and Family Institute and Co-Director of the International Center of Excellence in Emotionally Focused Therapy. She holds a Masters degree in Social Work and is a Registered Marriage and Family Therapist in Canada. Over the past 30 years, Gail has worked closely with Dr Sue Johnson, creator of Emotionally Focused Therapy, and is an experienced supervisor and trainer in EFT. She currently offers workshops, externships and core skills trainings to mental health professionals in a variety of different settings across the world. She chairs the ICEEFT Education Committee and is responsible for mentoring and training EFT trainers internationally. Gail is an adjunct faculty member at Wilfrid Laurier University in Waterloo, Canada and a sessional lecturer at Oxford University, Oxford, England. Gail has a particular interest in applying the model with work with families. For the past decade, Gail has been one of the lead EFT trainers who have developed and expanded on Sue Johnson’s EFFT method as described in Johnson, S.M. (2004) The Practice of Emotionally Focused Couple Therapy: Creating Connection. New York, NY: Brunner Routledge. This work has included EFFT trainings across North America, Europe and Australia/New Zealand, presentations at EFT summits, workshops at the Networker and AAMFT, publications in the EFFT workbook and casebook, articles in professional journals and the ICEEFT newsletter. Professionally, Gail’s primary passion is to help therapists who are both new to EFT and trained in EFT, to bring the powerful interventions and skills of this model to the family therapy room. Inschrijven voor het externship gebeurt via deze link. You can subscribe by following this link.